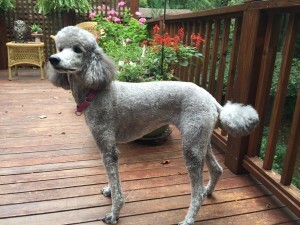 Sylvie is a 3.5 year old, spayed, female Standard Poodle. Her owner, Charlotte, suffers from a condition called neurocardiogenic syncope (NCS). The condition occurs when an identifiable trigger, such as sudden standing, rapid movement, long period stationary positioning, dehydration, fatigue, stress, or sometimes no identifiable trigger (idiopathic), elicits an autonomic brain stem response that affects neurostimulation of the vagus nerve. One of the functions of the vagus nerve is controlling parasympathetic a-v node innervation of the heart muscle. Vagal stimulation creates a negative chronotropic event (a reduction in heart rate). Concurrently, vasodilation (a widening of circulatory vessels) occurs, which prompts vasodepression (low blood pressure). Consequently, the NCS sufferer suddenly faints, although he/she may experience an aura prior to the fainting episode (syncope). The person remains temporarily unconscious until normal blood flow is restored to the brain, which occurs quickly with most falls. However, if fainting occurs with the head elevated upon reaching the ground, then the fainting state may endure and even progress to a seizure-like condition. Charlotte’s syncope events occur randomly and idiopathically. Her major concern is that she may suffer a head injury (TBI, fractured skull) or a broken pelvis upon impacting the ground or a hard indoor floor surface when she falls. Fortunately, she typically has an aura of lightheadedness approximately 3 seconds prior to experiencing syncope. The aura provides a warning, although very short, whereby we have trained Sylvie to intervene in a manner that enhances Charlotte’s safety. Sylvie, an NCS service dog trained via CPT’s Hands-On Service Dog Program. Sylvie was trained via CPT’s Hands-On Service Dog Program. Unlike the conventional board train service dog program that costs anywhere from $12,000 to $24,000, the Hands-On Program usually costs anywhere from $2,000 to $5,000. The Hands-On Program allows persons with disabilities, who have sufficient physical and psychological aptitude, time, patience, and diligence, to economically train their existing pets to perform in a service dog role. The program starts with an introductory meeting. During the introductory meeting, CPT President and Head Trainer Mark Spivak designs customized specifications for the client’s program. The specifications consider the medical nature of the disability, the pertinent effects and limitations posed by the disability, the client’s overall and/or general goals for the program, the specific behaviors from the dog that will best benefit the client in mitigating the effects/limitations of the disability and in improving the client’s quality of life, and the environmental applications where the client will most frequently employ the dog. After designing the general specifications, CPT and the client will collaborate while designing specifications for the ideal service dog, as the profile of the optimal dog will vary amongst programs. The canine specifications may include data on size, structure, breed, gender, coat type, coat color, energy level, age, temperament, behavior, aptitude, health, and prior training level. If the client already owns a pet that the client wishes to train, then CPT will evaluate the dog for suitability. If the dog does not closely meet the criteria for the program, then CPT will advise the client to acquire a more appropriate candidate animal. Similarly, if the client does not already own a pet, then CPT will assist the client in finding a candidate dog that closely matches the program specifications. If the evaluation concludes that the client’s current pet meets the criteria or when a new candidate is located and vetted by CPT and purchased by the client, then the training stage begins. The Hands-On program is usually comprised of a combination of group class, private instruction (at CPT-Sandy Springs), in-home private instruction, and remote private instruction. Sometimes, we also include short board trains. The exact construction is very flexible to match the client’s timelines, budget, and preferences, the age of the dog, and the goals and requirements of the client’s program specifications. In Charlotte’s case, Sylvie passed her evaluation with flying colors. Sylvie has the right size and structure, a calm disposition (especially considering her breed), confidence, a cooperative temperament, the right drive levels and aptitude for learning and performing the required behaviors, is healthy, and is a good age for service dog training. We first enrolled Sylvie in a CPT group class to teach her basic obedience behaviors and to rehearse her adherence amidst a distracting environment. We next included specialized instruction at CPT to teach the specific service behaviors not taught during group class. We then progressed to remote private instruction at parks and malls to rehearse the service scenario in challenging and practical environments. Given the nature of Charlotte’s disability, we trained Sylvie on the command “Brace” to immediately perform a Stand-Stay while withstanding a high magnitude of body weight placed atop her shoulder blades. Sylvie is then supposed to remain in the Stand-Stay position until released. We concurrently trained Charlotte to quickly and fluidly perform the human requirements that maximize the utility of the behavior. Since, Charlotte only has 3 seconds between the time she detects the aura and the time she faints she must act immediately, confidently, and accurately to maximize the probability that Sylvie will prevent a traumatic injury. In a practical circumstance, once Charlotte feels the onset of an aura she commands “Brace.” Sylvie responds by commencing a rock-solid Stand-Stay. Charlotte next places her left arm on Sylvie’s shoulder blades. She follows by going to her knees while leaning on Sylvie. Charlotte completes the behavior series by slowly going to the ground or by maintaining her body weight and head against Sylvie. The preceding custom-designed maneuver dramatically reduces the likelihood of Charlotte injuring her head or pelvis. Through repeated rehearsals supervised by CPT coaching in a variety of environmental settings, both Sylvie and Charlotte are prepared for when a syncope episode occurs. For more information on the CPT Hands-On Service Dog Program or other CPT custom designed service dog programs, please email CPT via the Contact page of www.cpt-training.com.